According to the New York Fed, Student loan debt is the only form of consumer debt that has grown since the peak of consumer debt in 2008. Moreover, student loans balances have eclipsed both auto loans and credit cards, making student loan debt the largest form of consumer debt outside of mortgages. The Fed has some interesting charts on Student Loan Debt History through first quarter of 2012. Debt levels are higher now, with student debt at $956 billion through third quarter. What caught my eye however, is skyrocketing debt in the age group 30-39. Even if it took someone age 18, eight to ten years to finish college, they would still be 28 years old at most when they finished their education. Yet, student debt in the 30-39 demographic group now exceeds that of the under 30 age group. Moreover, the under age 30 group accounts for less than a third of the overall student debt. Over-two thirds of student debt is held by those well outside the normal student demographic! This trend is not entirely recession-related given that it has been steady since 2005. Someone exiting military service would be covered for 36 months of in-state education by the GI Bill. Someone working for a major employer for any significant length of time would likely have some or all education expenses paid for by the company. Those aged 30-39 would be far more likely to have steady income than someone 18-24, thereby avoiding the need to rack up as much debt. If you are 30 years or older, sitting on a pile of student debt, and are willing to tell your story how and why that happened, Please Email Mish. If I get any interesting letters, I may share some of the stories. Meanwhile, as student debt piles up, wage growth for college grads certainly doesn't. 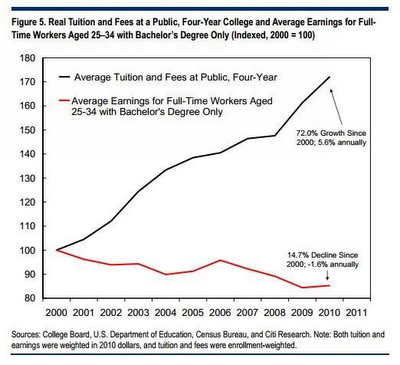 Please consider a Shocking Chart on Tuition vs. Earnings for College Grads on The Fiscal Times. Student debt levels have reached a new high – rising $42 billion in the last quarter to $956 billion, according to a report this week from the New York Fed. At the same time, tuition rates have seen a staggering 72 percent increase since 2000.